Healthy individuals modulate muscle activation patterns according to intended movement and environment. Persons with neurological movement disorders (e.g., stroke and spinal cord injury), however, have problems with motor control due primarily to their inability to modulate their muscle activation pattern in an appropriate manner. Investigation into the association between neurological impairment and muscle-activation pattern is critical for future diagnosis and treatment since the modulated muscle-activation pattern is expected to be associated with the type and degree of impairment.The most efficient way to find a difference in the modulation of a muscle-activation pattern is to apply a unique load combination that induces a predictable muscle-activation pattern modulation in healthy adults which contrasts with the modulation in affected patients. The individual muscle-force control technique uses an exoskeleton robot to induce an arbitrary muscle activation pattern in patients when performing robot-assisted motor tasks. The exoskeleton can assist or resist the subject’s joint torques, and the subject is asked to accomplish the task by opposing the robot.Concept of neuromuscular function test by using an exoskeleton: [Step1] Determine target muscles of interest and designate desired changes. [Step2] The physiology-based optimality criterion checks the feasibility of given changes in target muscle forces. The force that the subject must to exert to the handle is calculated. Control commands to the exoskeleton robot are calculated. [Step3] Exoskeleton robot applies joint torques against the subject. Subjects perform a force-matching task to match the hand-force with the instructed force by a monitor by opposing the exoskeleton robot. EMG measurement equipment records muscle activities. [Step4] The physical interaction induces a desired muscle activation pattern in subject’s muscles. Comparisons between the recorded muscle activation pattern and stereotypical (normal) pattern predicted by the musculoskeletal human model will be made. Due to the presence of muscle redundancy, joint-torques and muscle-forces are intricately coupled; this makes motor-task planning difficult and greatly limits the variety of function tests. By mathematically solving the joint torque-muscle force relationship using a musculoskeletal model, the algorithm systematically computes an adequate motor task that induces a desired muscle activation pattern in subjects. The proposed motor-task planning for neuromuscular function tests computes an adequate magnitude and direction of a force that a subject must exert to induce a desired change in a target muscle force. An exoskeleton-type wearable robot is utilized to assist the change of joint torques. The overall system consists of a wearable actuator device, a handle, a muscle force control problem solver, a musculoskeletal human model, and a user-friendly graphical interface. The individual muscle control by using an exoskeleton induces an arbitrary muscle activation pattern by mathematically solving the physical interaction at the level of individual muscles. The method is to solve not only a complex coupling between multiple muscles and joints but also the optimization principle in the neuromuscular system that coordinates redundant muscles. Preliminary results implied that muscle activities that may not be achieved in the standard exercise environment can be induced. In the past two decades, a number of muscle-force prediction methods have been presented based on the optimization principle in the neuromuscular system. Static optimization method predicts redundant muscle forces by minimizing a physiology-based cost function, comprising the sum of muscular stress or force raised to a power, subject to force/torque constraints associated with a given task. The individual muscle control is to solve the inverse problem of the aforementioned muscle force prediction. Note that this inverse solution is not straightforward since the induced muscle activation pattern must satisfy the physiology-based optimality criterion. Mathematically this problem can be regarded as a problem to determine adequate equality constraints (i.e., joint torques) for the physiology-based cost function such that the desired muscle forces are obtained as a result of the cost function minimization. Since one of the equality constraints is on joint torques, the use of an exoskeleton-type robot is essential to adequately assist/resist joint torques. Introducing Karush-Kuhn-Tucker (KKT) conditions provides conditions such that induced muscle forces do not violate the optimization principle in the neuromuscular system. A proof-of-concept wearable exoskeleton robot was developed. Unlike other exoskeleton mechanisms, the robots do not have any rigid links but flexible pneumatic actuators for safety reasons. Both ends of each actuator are attached to plastic frames. Pneumatic servo-valves regulate the internal pressure of the actuators. Each actuator is equipped with a force transducer to apply force feedback control. Currently there is no actuator to apply torques to the shoulder joint due to the complexity of the shoulder joint mechanism. The robot assists/resists 4 degrees of freedom (DOFs) in the human arm; 1 DOF for the flexion/extension of the elbow joint, 1 DOF for the supination/pronation of the forearm, and 2 DOF for the flexion/extension and adduction/abduction of the wrist joint, by using 8-10 pneumatic artificial actuators. An integrated human-exoskeleton model computes the interaction between the human muscle forces and torques generated by the robot. The integrated musculoskeletal model of the human upper-right limb calculates moment-arms from to each of the muscles to attached bones. This model consists of 5 rigid links with 12 joints corresponding to the waist, neck, shoulder, elbow, and wrist. Massless-wires model a total 51 muscles. The points of muscle attachment (origins and insertions) were determined based on anatomical data. A kinematic model of the exoskeleton that consists of pneumatic actuators and supporting frames was integrated with the human model. This model was created by Reishi Oya formerly at Nara Institute of Science and Technology, Japan. Preliminary results of inducing the changes in individual muscle forces to desired levels by providing assistive/resistive torques in various directions with the exoskeleton. The photo shows the exoskeleton robot with pneumatic actuators attached to the upper body. Six subjects held a 2-kg load while keeping the elbow joint angle at 90 deg. A: The exoskeleton imposed a set of joint torques aiming at increasing the force of extensor carpi ulnaris muscle (ECU) by 30% from its nominal force while maintaining the force of brachialis (BRA) and brachioradialis (BRD) muscles. B: The exoskeleton imposed torques aiming at reducing the force of BRA and BRD by 50% of their nominal force while maintaining the force of ECU. C: The exoskeleton imposed torques aiming at increasing ECU force by 30% and decreasing the force of BRA and BRD by 50%. Relative changes in EMG amplitude (black bars) that correspond to desired relative change in force (grey bars) demonstrated the efficacy of the exoskeleton for inducing desired muscle activity. The robots used in this study include a wearable robotic exoskeleton and a robotic arm for subjects to grip. These robots applied forces and torques on the arm joints or hand of each subject while the subject held a given arm position. The forces and torques were chosen to induce specific activity in target muscle as predicted by a mathematical muscle model. A variety of elbow and wrist muscles were targeted and simultaneously controlled. To verify how well the robots controlled target muscle activity, we monitored electromyography (EMG) and ultrasound elastography (measurement of muscle stiffness using sound waves). Electrical activity and stiffness increase as the muscle contraction increases. The goals of this study were to develop and assess these new systems and to compare results obtained via EMG and elastography. Results show that the robotic systems were both able to induce general desired changes (increase, decrease or hold) in target muscle activity, but require further work to increase the precision of muscle activity control. We also found that elastography data was less variable than EMG and had a stronger linear relationship with changing force. Jun Ueda and Ming Ding, “Individual Control of Redundant Skeletal Muscles using an Exoskeleton Robot,” Redundancy in Robot Manipulators and Multi-Robot Systems,, Lecture Notes in Electrical Engineering, pp. 183-199, Vol. 57, Edited by Dejan Milutinovic and Jacob Rosen, ISBN 978-3-642-33970-7, Springer, 2013. William Gallagher, Ming Ding, Jun Ueda, “Relaxed Individual Control of Skeletal Muscle Forces via Physical Human-robot Interaction,” Multibody System Dynamics, Vol. 30, Issue 1, June 2013. 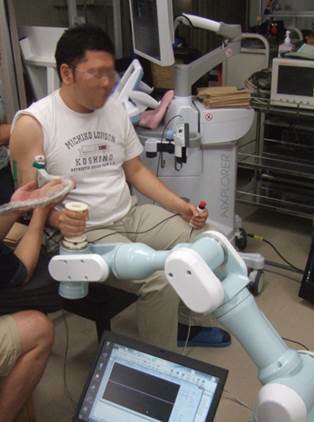 Jun Ueda, Ming Ding, Vijaya Krishnamoorthy, Minoru Shinohara, Tsukasa Ogasawara, “Individual Muscle Control using an Exoskeleton Robot for Muscle Function Testing, ” IEEE Transactions on Neural and Rehabilitation Systems Engineering, Vol.18, No.4, pp.339-350, Aug. 2010. Tsukasa Ogasawara and Jun Ueda, Chapter 7: Assistive device, Applications and Progress for Advanced Man-machine Interfaces and Information Technologies- “Neo-kaden” project in Keihanna Knowledge Cluster-, ISBN978-4-88231-999-3, in Japanese. Pinpointed Muscle Force Control Taking Into Account the Control DOF of Power-assisting Device,” the 2010 Dynamic Systems and Control Conference (DSCC’10), Boston, MA, 2010. Jun Ueda, Moiz Hyderabadwala, Vijaya Krishnamoorthy, Minoru Shinohara, “Motor Task Planning for Neuromuscular Function Tests using an Individual Muscle Control Technique,” 2009 IEEE 11th International Conference on Rehabilitation Robotics, Kyoto, Japan, June 2009. Jun Ueda, Moiz Hyderabadwala, Ming Ding, Tsukasa Ogasawara, Vijaya Krishnamoorthy, Minoru Shinohara, “Individual Muscle Control using an Exoskeleton Robot for Muscle Function Testing, ” the 2009 Dynamic Systems and Control Conference (DSCC’09) , Hollywood, California, October 12-14, 2009. Ming Ding, Jun Ueda, Tsukasa Ogasawara, “Pinpointed Muscle Force Control Using a Power-Assisting Device: System Configuration and Experiment,” The 2nd IEEE / RAS-EMBS International Conference on Biomedical Robotics and Biomechatronics (BioRob 2008). Jun Ueda, Masayuki Matsugashita, Reishi Oya, and Tsukasa Ogasawara, “Control of Muscle Force During Exercise Using a Musculoskeletal-Exoskeletal Integrated Human Model,” Experimental Robotics, The 10th International Symposium on Experimental Robotics, Springer Tracts in Advanced Robotics, ISBN:978-3-540-77456-3,pp. 143–152, Volume 39, 2008. Jun Ueda, Ming Ding, Masayuki Matsugashita, Reishi Oya, Tsukasa Ogasawara “Pinpointed control of muscles by using power-assisting device,” Proceedings of the 2007 IEEE International Conference on Robotics and Automation (ICRA 2007), pp. 3821-3828, Roma, Italy, April, 2007. National Science Foundation-Japan Science and Technology Agency (NSF-JST) Strategic Cooperative program in Robotics, Joint Research Program for Innovative Rehabilitation Support Technology Based on Fusion of Engineering, Medical, and Physiological Sciences (US side PI: Ueda, Japan side PI: Ogasawara), 04/2010-09/2012 (Link to JST).